A common and usually painless condition, flatfeet may occur when the arches don't develop during childhood. 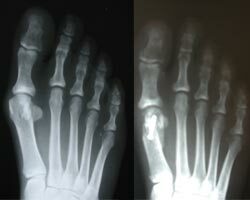 In other cases, flatfeet may develop after an injury or from the simple wear-and-tear stresses of age. Flatfeet can sometimes contribute to problems in your ankles and knees because the condition can alter optimal alignment of your legs. If you aren't experiencing any pain, no treatment is usually necessary for flatfeet.